In 2009 when Benjamin Netanyahu was coming to power in Israel, excavation on the high ridge west of the Gihon Spring revealed a most important artifact. Permission to excavate began with a crack that threatened a potential landslide. This prompted a rapid approval, so the excavation at Beit Shalem above and west of the high ridge of the Gihon Spring began. Within a few months, the team had made great progress removing rubble below the original crack line. 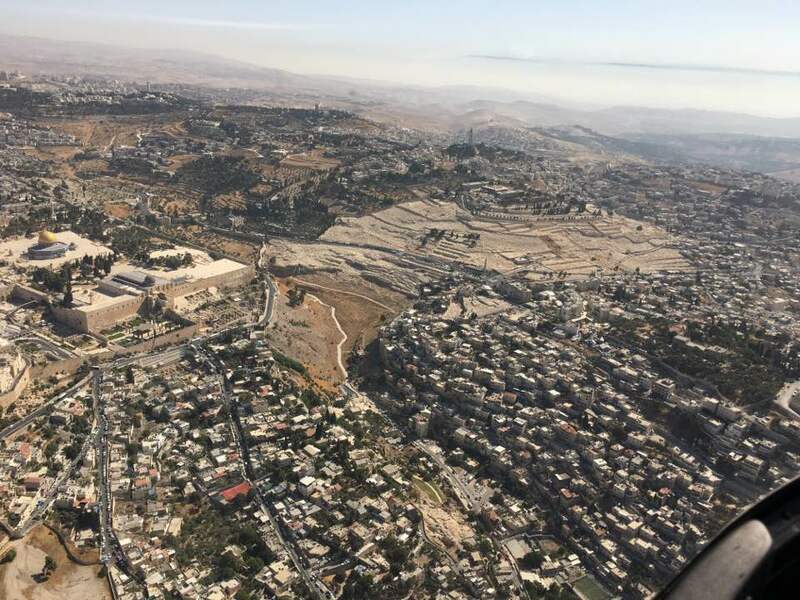 A 30X8m super-tension retaining wall was built to hold the significant section of Mount Moriah’s eastern slope (below, temple mount seen north). Four years to plan and construct, the wall had to be anchored in bedrock at several points and at each level. Casing each anchor was slow going to avoid penetrating and damaging buried artifacts. Approximately 500 cubic meters of rubble and dirt were ultimately removed for archaeological sifting. As the retaining wall descended to 3 meters above the bedrock archaeologists began to discover late iron-age Roman era walls and several pottery artefacts. A collapsed section was well preserved in a narrow passage that had been blocked at its east exit by a ~50cm(w) late iron age (North-South) wall section. At 2m above the bedrock, pottery and other artifacts were found in blackened layer dated to the Babylonian destruction of Jerusalem in 586 BCE. Below the blackened destruction (seen in the image left) layers may yet reveal artifacts that inform about the periods prior. The video below was made by the Antiquities Authority to describe some of the latest findings. The excavation discussed above, is behind (west) of the western wall of the high ridge, top of image below. Of particular interest on the high ridge is the impressive ‘tziun’, ‘matzevah’, monument or covenant, now protected by the steel cabinet. Archaeologists confirm it was once protected by soft earth contained between the west and a dismantled east wall. Earliest indicators perhaps as far back as 4500 years are hewn directly into the bedrock including cave dwelling, altar, oil and flour presses and facilities for animal slaughter. Sunlight now reaches the bedrock, the first time in ~3000 years. The bedrock at the western excavation (behind the wall in the image above) descends eastward toward the matzevah dropping by about 1.5m to the bedrock on the high ridge complex (seen below). The complex was hewn using basic rock implements. The volume of this ~4x8x2(h) meter complex is significant. All walls of the rooms were retained from the bedrock. According to Biblical dating matzevot were last used at the time of Abraham, Isaac and Jacob. Here placement on the hewn bedrock floor provides some important dating targets to around ~2000 BCE, pre-dating King David by 1000 years. Immediately east of the high ridge as it descends toward the valley is the rock cut pool leading from the Gihon Spring. Large volumes of fish-bones, bones of kosher animals and pictographic bullae were discovered in its lowest levels. Pictographic seals discovered in the sediment of the rock cut pool equate in vloume to all the other non-pictographic seals discovered elsewhere in the City of David. Perhaps indicating something akin to important people throwing pennies in a pond or leaving notes in a wall. This raises questions about the dating of seals (bullae) that were contained to the pool compared to those of the period of kings. 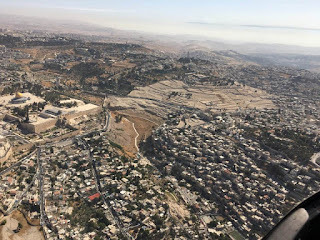 The Matzevah in context of the City of David on Mount Moriah is a significant archaeological event. If academic analysis supports that hewn bedrock coincides with biblical Shem then the Matzevah is likely to converge with dating for the story of Jacob (Genesis 28:10-22). This would further validate the high ridge to Isaac and Abraham, when it became known as “the Place” (Ha Makom). As such it will have significant implications for theological and religious interpretation of events relative to first temple construction and third temple location. Jonathan the grandson of Moses is one of Torah’s most complex characters. Perhaps in the tradition of first born sons, Jonathan's connection with his grandfather can be expected to reflect in him the essential trait that we know of Moses. So what are the qualities of Moses that Jonathan carried into the next generation? What of his grandfather's causes motivated him to struggle for and express in his own life? Tribal structure is a rigid mosaic that strongly influences personalities, against this backdrop I explore Jonathan. The information I used to write this is from and based on the compilation known as Me’Am Lo’ez as translated by Rabbi Aryeh Kaplan. After Israel’s re-entry to their land each tribe had conquered and settled their allotment except one. The tribe of Dan had been left to struggle against the Philistines, one of Israel’s greatest opponents, but they failed in their quest. Meanwhile, Jonathan a priest of the Levite tribe had distanced himself from the decaying priesthood in the Tabernacle of Shiloh, the territory of Ephraim. Nearby, a competing temple had attracted Jonathan to its serenity and Micah, its founder enlisted him as high priest. Leaders of tribe Dan were advancing to conquer and settle more land in the north. On one trip they forcefully raised the serene temple and moved it, with Jonathan to the mountain opposite the valley of Shiloh. Perhaps a statement to the tribes who had not supported them in their original conquest. On one occasion Jonathan The Levite was traveling the straight line north, with his concubine from Bethlehem in Yehudah through Jerusalem (Jebus) to the area of Shiloh in Ephraim. It was nearing sun set, but he pushed on past Jebus, the walled city until he reached Gibeah in Benjamin a territory sandwiched between rivals Yehudah and Ephraim. The residents of Gibeah were unfriendly and refused him accommodation until one man opened his heart. That night certain townsfolk violently threatened the old man and his guests physically demanding the concubine be released to them. Jonathan capitulated, the concubine was gang raped and left to die in the cold night at the front door of the man’s house. Jonathan was incensed especially because the elders refused to hand over the perpetrators or bring them to justice. Jonathan journeyed home, where he cut her body in 12 pieces and sent a piece to each tribal leader demanding they bring Gibeah to justice. This motivated Israel’s first major civil war and men of the tribe of Benjamin were almost entirely wiped out. Once the tribal leaders realized what they had done to the tribe of Benjamin they implemented a program to repopulate the tribe, by allowing inter-tribal marriages for the benefit of the women of Benjamin. Today that is the festival of Tu B'Av, which comes 6 days after the temple destruction's on Tisha B'Av. The corruption of leadership and justice was a battle Jonathan silently witnessed and eventually he rose to crush it. First it was the corrupt priesthood which he abandoned for a more serene existence, despite the antithetical form of worship. Next he was transplanted from serenity to the heart of politically inspired religion. Finally he was stirred to act in the name of his grandfather and unite the tribes against one of their own in the name of justice. The expression of Moses through his grandsons actions finally motivated the nation to seek a leader who would unite them. That was a job for young Samuel, who had been appointed high priest at the end of the Tabernacle period in Shiloh. His first choice was King Saul of the tribe of Benjamin that had been so brutally affected in the preceding Civil war. In this sense Jonathan’s actions resembled his grandfathers to fight corruption and uphold justice. Rivalry between Ephraim and Yehudah had been so fierce, but Yehudah would prevail and the next temples built in Jerusalem. Ephraim’s brother Menashe was represented as instigator and in the writings of Samuel he poetically super-scripted Jonathan son of Gershom son of Menashe. The basis of a temple is justice, not rigid law enforced on a people to their detriment as it was in Gibeah nor corrupt practices that suppress leaders who would otherwise benefit the majority. Like Moses, Jonathan struggled for a temple culture that would balance the nation and a justice that would permit and motivate all people to realize their true potential.